What does the rest of 2018 hold in store for electric vehicles? My own CleanTechnica predictions article, “2 Dozen Electric Vehicle Predictions For 2018,” generated 394 comments and some great conversation about likely EV trends happening in 2018. That engagement with CleanTechnica readers inspired me to then seek out predictions from several industry experts. 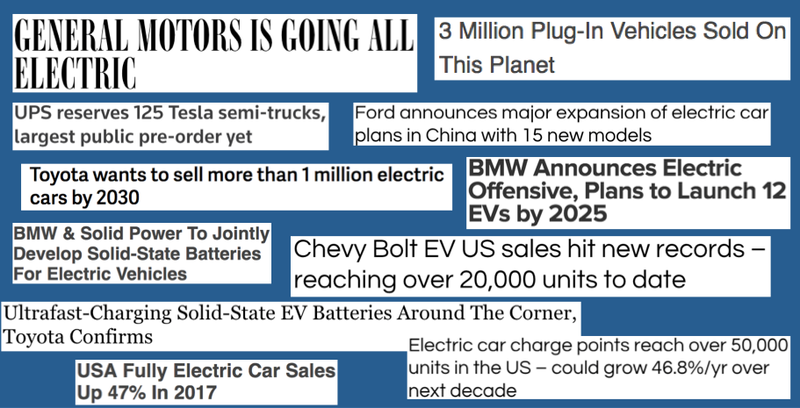 What will be the biggest electric vehicle news story or development in 2018? The easiest way to read the experts’ predictions is by viewing the quotes and predictions in the following PowerPoint presentation on SlideShare (linked below). But I’ve also grabbed the quotes and organized them below by 4 broad topic areas. Doug Campbell, Solid Power — 2017 saw many major automakers and governing bodies promise a transition to all-electric, meanwhile plug-in vehicle sales surpassed 1% of the global market. We have since learned a tremendous amount about battery requirements and performance needed to unlock this market, but the same effort needs to be placed in driving consumer adoption. Following last year’s commitments, 2018 will be the inflection point; with improved technology, vehicle diversity, and overall sales experience helping propel the EV customer base beyond early adopters. Matt Teske, Chargeway — Throughout 2018, news of upcoming electric cars will continue to increase, eliciting more interest from the general public. This trend will shed a brighter light on the necessity to improve electric car marketing and communication strategy in order to compete more effectively with gas-powered vehicles. Explaining the electric car customer experience more easily to dealerships and average people is a top priority for increasing sales. Without a new strategy electric cars will continue to have a niche identity with consumers. Scott Mercer, Volta Charging — EV adoption and charging infrastructure will reach a tipping point as U.S. drivers enter the age of EVs without compromise. We’ve found that 81% of people already live within 5 miles of an EV charging station, and 56% live within 2 miles of one. But in 2018, infrastructure access and awareness will join supply as key talking points in the e-mobility conversation – and we will see a massive proliferation of useful, universal EV infrastructure. Caradoc Ehrenhalt, EV Safe Charge — Auto manufacturers are committing to fewer gas-powered vehicles, so we see the biggest development is the overall ‘pull’ being initiated by those car makers for infrastructure that’ll help support that enormous growth in vehicles over the coming decades. Convenience and “range confidence” will grow enormously, with dramatic drops in “fueling” time as Level 2 and DC Fast charging come online. While fixed infrastructure remains the number one priority, mobile charging systems will make access much easier, especially in this transitional time. Isaac Wittenstein, TEQ Charging — This year we will see the first set of national mainstream advertisements for electric vehicles across multiple brands. The increased awareness and knowledge of electric vehicles and the infrastructure will be critical in reducing the anxiety and increasing comfort in choosing electric. These more educated and intent buyers will also result in more engaged and EV-friendly salespeople at dealerships, ultimately helping shift the market from early adopters to the early majority. Alex Gruzen, WiTricity — The first EV from a major automaker will ship with wireless charging. Everything is going wireless and EVs are no different. No mess, no hassle and no plugs. As BMW recently started promoting, Wireless charging will be easier than refueling. In 2018 the SAE global standard for wireless EV charging will be finalized, demonstrating that wireless power transfer is being embraced by all automakers. From making the EV experience more consumer-friendly, to enabling AV robo-taxis – wireless EV charging is on track to become ubiquitous. John Kalb, EV Charging Pros — I predict that an entrepreneurial organization will recognize the strategic value of the “electrified fueling station of the future” and will announce a significant investment in development of these stations in the US. These fueling stations will not be developed for the top 10 existing electric vehicle markets, but more broadly located in the top 10-50 cities nationwide. 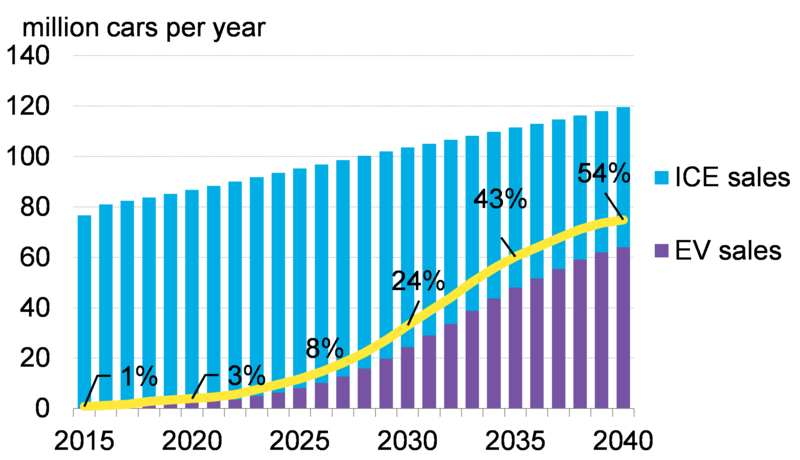 If you build it, they will come, and being first in these markets by 2022 will provide market differentiation as the electrification of the transportation system scales. Terry O’Day, EVgo — Building on existing investments of ~$2B from EV charging companies, automakers, property owners, and others, 2018 has brought announcements of planned investments in EV charging stations in the North American market to exceed $8 billion. 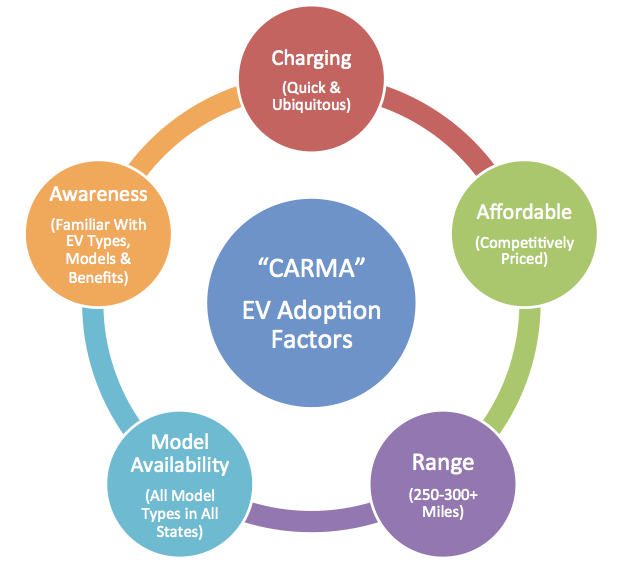 Combined with the proliferation of longer-range and lower-cost EV models, current and future infrastructure investments over the next 5–10 years are intended to give product planners and consumers confidence in EV charging station infrastructure to improve charging times, enable long-range driving, and reach diverse communities. Mike Calise, Blink Charging — In the US, 2018 will be the tipping point and most profound year in EV history. From ~100 EVs in 2010, ~10k sold in 2011, ~100k cumulative through 2013, ~100k sold in 2014, and ~200k sold in 2017, the growth of EVs has grown exponentially. Jason France, ClipperCreek, Inc. — We expect the monthly electric vehicle sales rate to double by the end of 2018 with the affordable, long-range Nissan Leaf, Chevy Bolt and Tesla Model 3 now available. Joel Levin, Plug-in America — US plug-in car sales will nearly double to 2% of the auto market. Sales will really take off this summer when a number of new models start getting delivered in large numbers. The Tesla Model 3 will be a big part of this story, as deliveries gradually ramp up, but the 2018 Nissan LEAF and new Honda PHEV Clarity will also start to move in large numbers during 2018. The Chevy Bolt, which sold over 3200 units in December, will continue to grow in popularity in 2018. Big growth in these four cars, together with steady increases in a number of other models, and overall flat sales among gas cars, should easily push EVs to 2% market share in 2018. Watch for lots of press stories about the “arrival” of the EV this summer and fall. Pasquale Romano, ChargePoint — In 2018, there will no longer be a question about whether electric drive will be the technology that propels goods and people for the foreseeable future. This year, the new focus will be on the fleetification of everything and how that, coupled with electric drive, will change our lives more than we ever expected. Traditional segments like transit bus and delivery vehicle fleets will start to make significant strides towards electric and the move from owned to shared models will accelerate due to the tremendous advantages that electrification and autonomous drive bring to the table. Arcady Sosinov, FreeWire Technologies — Managed fleet companies (like Avis Budget Group) will announce major programs to electrify their fleets, and non-managed fleet companie​s (such as Uber, Lyft) will announce incentives for drivers to use electric vehicles rather than combustion vehicles. That will spur investment in EV fast charging by the fleet companies themselves, with Uber and others deploying charging around urban centers. I also believe by 2019, utilities will partner up with these fleets to subsidize the cost of deployment of this charging infrastructure. Dan Sturges, Transportation Revolutionary — 2018 is when EVs become mainstream, with nearly every large automotive company having an EV offering. 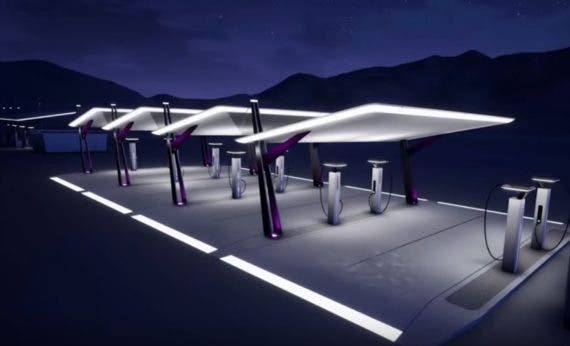 And as efforts to greatly expand EV charging around the US take place, more focus will begin on installing EV charging infrastructure in locations that can be converted to “backstage” locations to support autonomous (e-powered) vehicles. 2018 will also become the year where new “multi-mobility” (Uber, Lyft, Didi, etc.) services gain traction with consumer-citizens (aka “consumizens”) beginning to move past car ownership. As this shift in mobility occurs the smaller the behavior change for EV adoption will seem to consumizens. What do you think? Who has painted the most interesting or accurate view of what will be big news for electric vehicles in 2018? Here is a little background on the 14 industry executives who participated in this predictions project. In the slide presentation you can find their job titles, Twitter handles, and website URLs. I had reached out to 17 industry executives of which 1 declined (Big 3 automaker) and 2 others did not respond. 11 of the 14 are with EV charging related companies, one is with an EV association, one with a solid-state battery company and one a long-time transportation and mobility expert. Most are executives that I had spoken with over the last year when researching CleanTechnica articles or was introduced to by others. Unfortunately, all 14 participants are males, though I did invite 2 female CEOs to contribute (one did not respond and the other delegated to a male executive). I hope to correct this in future similar projects.